42nd Foot "the Black Watch"
Here are some pics of the new Perry British artillery in "cap-hats". The uniform these figures are wearing has generated a fair amount of discussion on the web, I think because many people (myself included) had no idea what it was or where it came from. 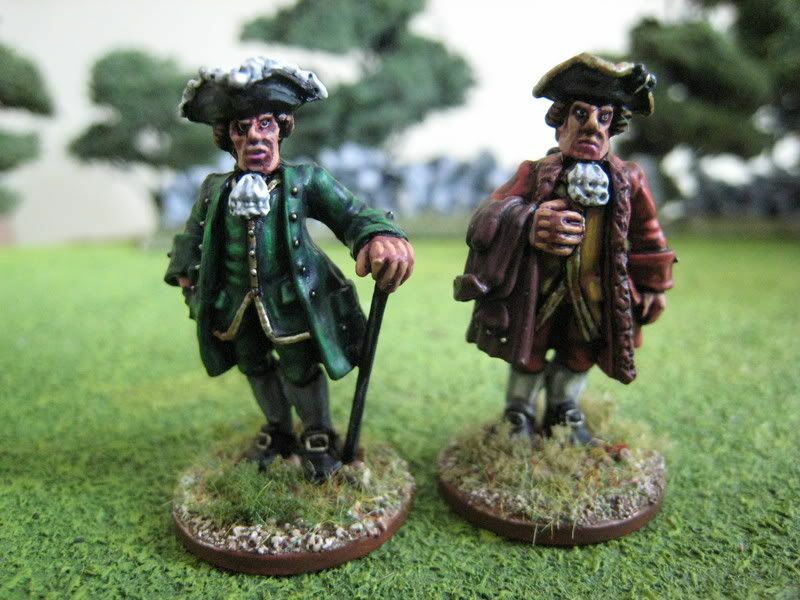 These figures represent the RA serving in the northern theatre from 1778 onwards, wearing a "campaign dress" uniform . There are reports of artillerymen making single-breasted jackets from old coats. The uniforms look like "roundabouts" or sleeved-waistcoats, but the turn-ups at the front and back indicate altered regimental coats. I understand the sources for this uniform (and the caps) are references in memoirs and one of the von Germann drawings. 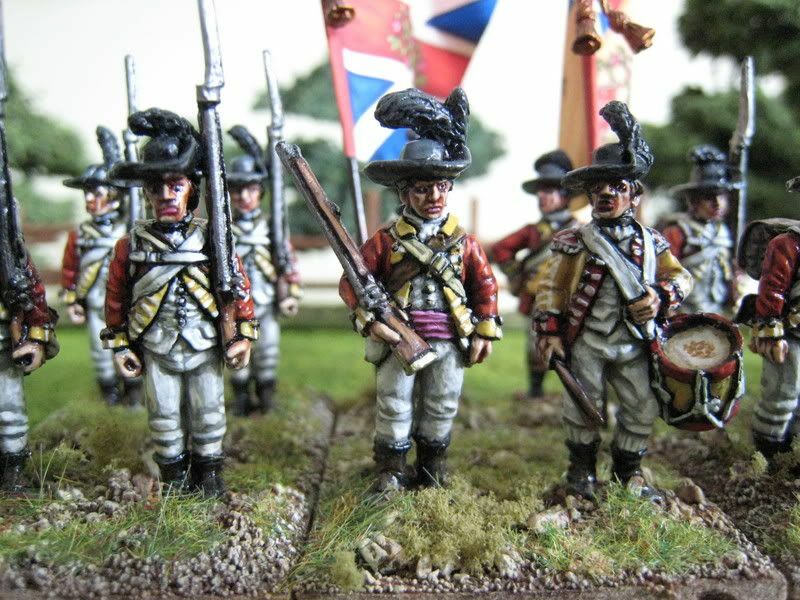 I painted the turn-backs red rather than white as according the Osprey MAA "King George's Army 3" white turnbacks didn't generally reach the RA uniforms until 1783. These are nice figures. The crew who are "running-up" their gun have excellent grimaces (not really visible on the photos) which suggest they are really putting their backs into their work. I was initially quite hesitant about placing two of the figures in the firing crew on either side of the gun's muzzle as I thought it looked too dangerous to be realistic; but apparently this is how they were placed (RtL has mentioned an incident at Waterloo in which a gunner slipped and fell in front of the muzzle just as the gun was fired, doing himself substantial injury). The two figures look as though they are turning their heads away from something loud and potentially rather nasty. 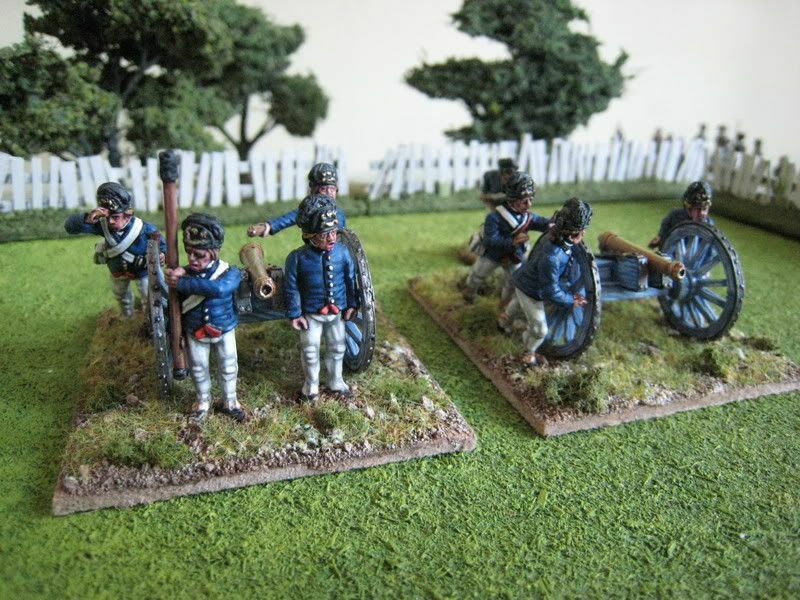 The guns and crews are based on 60mm x 70mm bases for the "British Grenadier" rules. 8 figures. Painted April 2007. 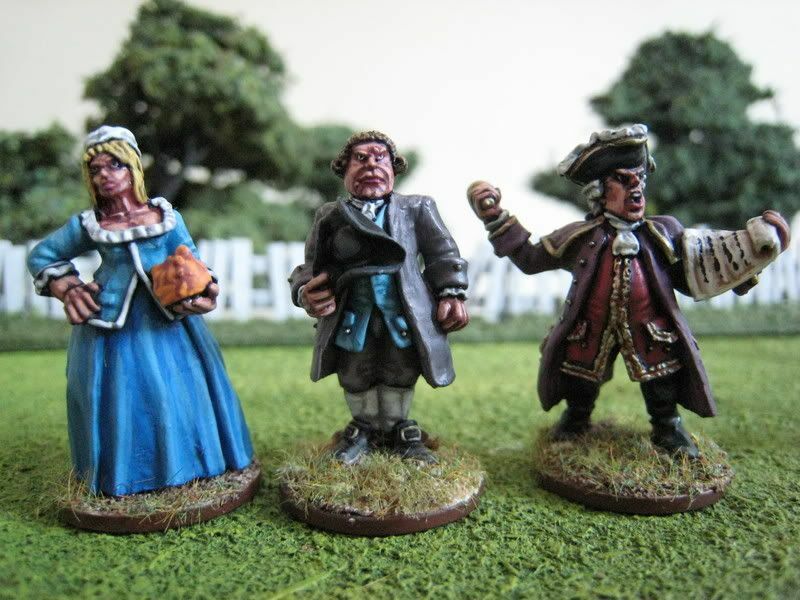 These are the figures from another un-released Foundry pack, "Townsfolk" or "CIV6". These are again Rob Baker sculpts and exhibit his sculpting tics - large hands, calves and bottoms, and fingers the length of rolling pins. I think the best figure is the woman, although her backside is even bigger than J-Lo's. I also have no idea what she's supposed to be carrying. The uniform of the crippled soldiers is that of the Albany Militia Regiment, c.1745-63, which I found in Osprey's "Colonial American Troops (2). I did some quick and dirty internet research on the breed of pigs that might have existed in 1770s New York, but I won't bore you with it and in the end just went for an average "pink" pig. I quite like the scene of the kid running away from the pig's lawful owner, although I'm not sure why the butcher/shopkeeper is carrying a bottle of wine; a meat cleaver or ham joint would seem more appropriate. 6 figures. Painted May 2007. The 2nd Maryland Regiment was formed in January 1777 from various companies that had been raised the previous year. It formed part of the 2nd Maryland Brigade in Sullivan's 3rd Division, alongside the 4th, 6th and 8th Maryland Regiments (the 8th also being called the "German Battalion") and Hazen's 2nd Canadian Regiment. The unit fought throughout the war, at New York, Brandywine , Germantown, Monmouth, Camden and Guilford Courthouse. It suffered particularly badly at Camden, where by all accounts it went to pieces. Deserter descriptions refer to blue coats faced red. 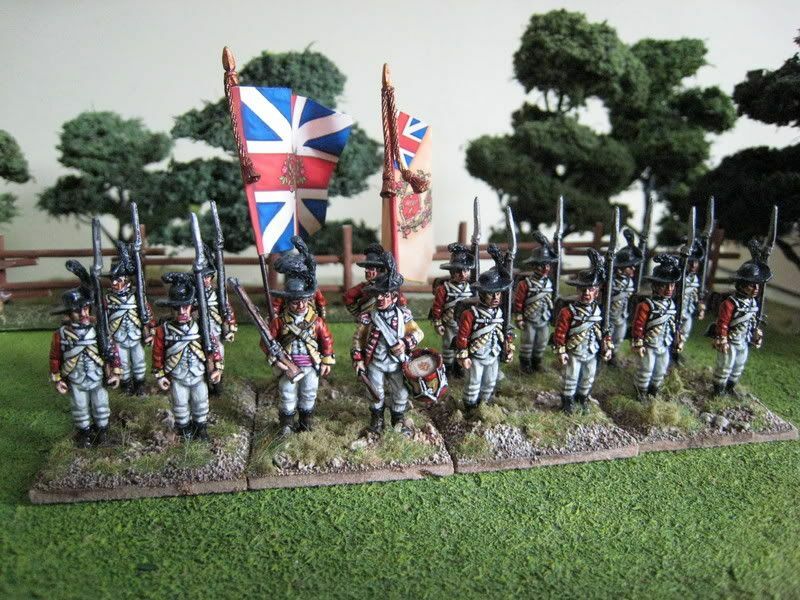 I used this uniform and added red turnbacks instead of white for the sake of variety, given that I have several other regiments in the same coloured coats. I painted the command stand of this unit quite early in my AWI career. 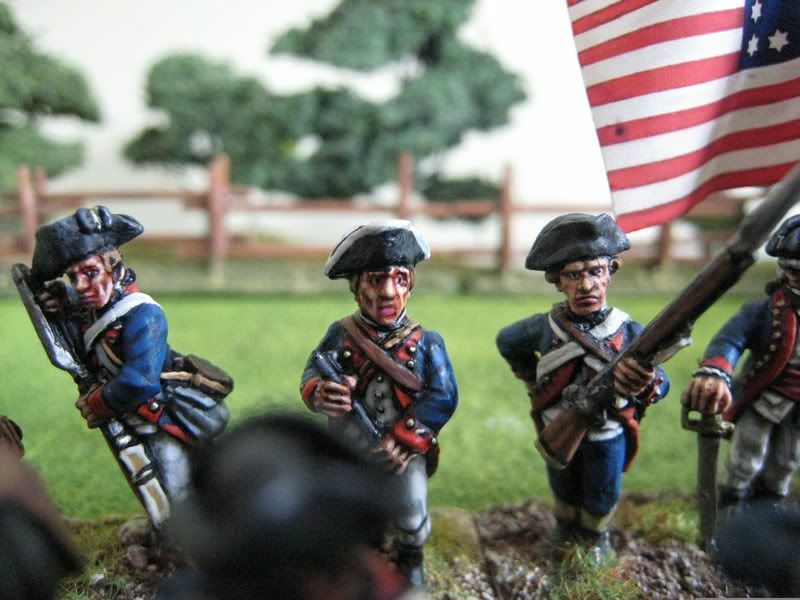 I began my American troops by building up Sullivan's command for the battle of Brandywine. At this stage in the war many American units were badly understrength and the 2nd Maryland is recorded as having fielded about 120 men. On a ratio of 1:20 that means a unit of only 6 figures, which is how I originally modelled it. 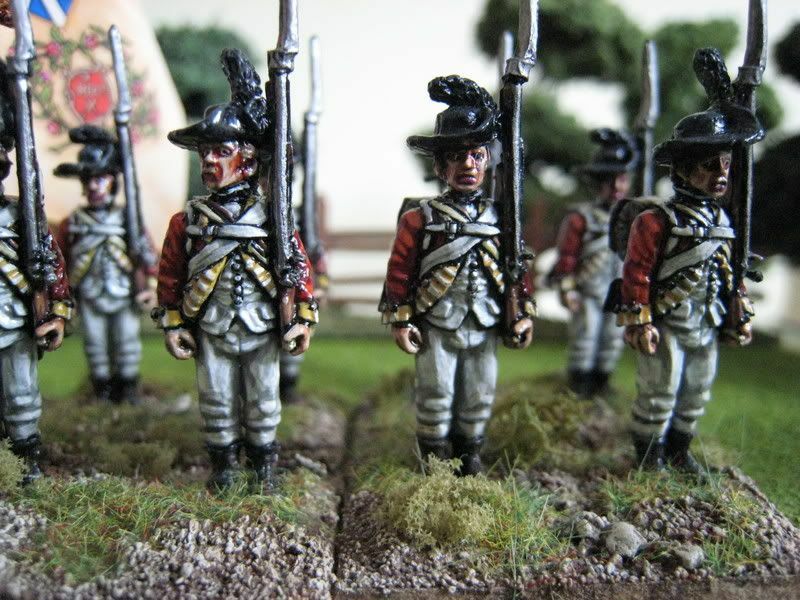 "British Grenadier" scenarios usually combine small regiments into composite units. 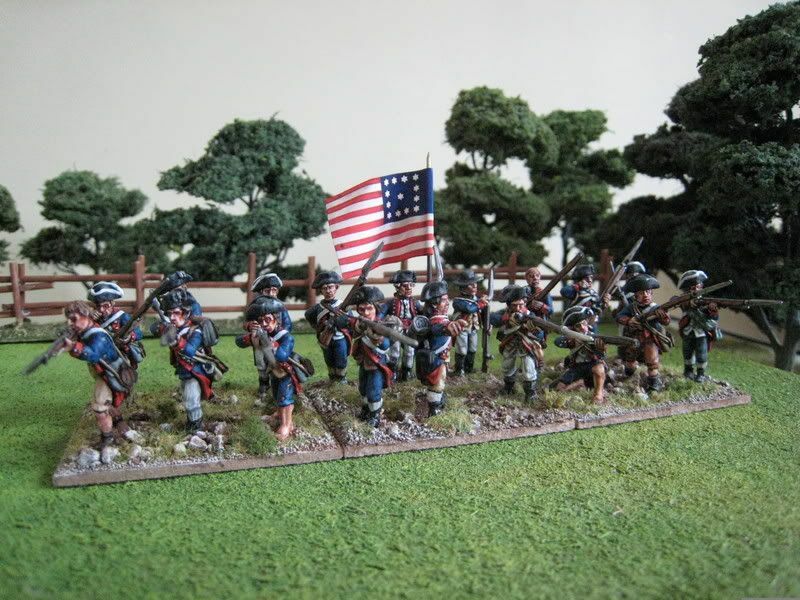 So, for example, the Brandywine scenario combines the 2nd Maryland with the 4th Maryland into a unit of 16 figures. This makes for a more even game, but I wonder how it effects the historical nature of the fighting: the British regulars would have found it much easier to pick off and disperse small regiments of 120 men than composite regiments of (say) 500, and that is reflected in the rule mechanics. Then again, perhaps the American commanders did combine their troops like this, in order to create units with sufficient critical mass to be able to better hold their own in battle. 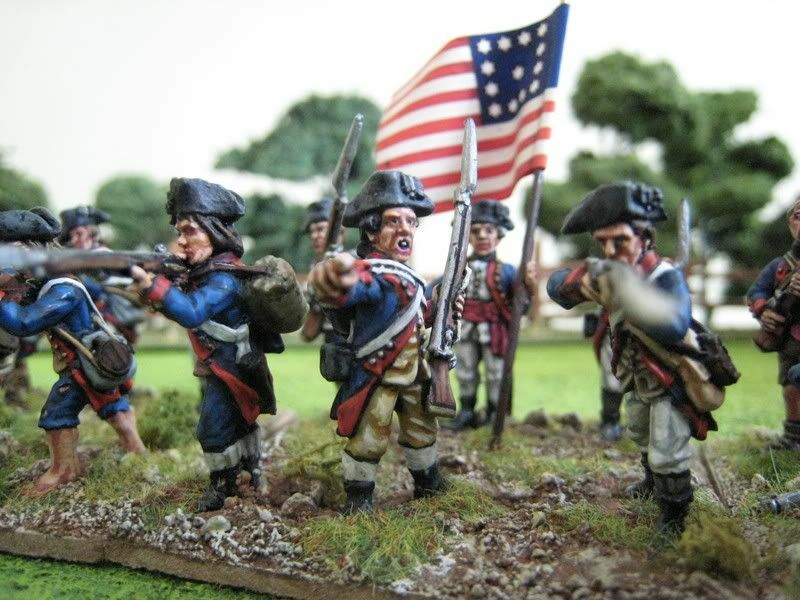 It would be interesting to see how a "British Grenadier" refight of Brandywine worked out with a larger number of smaller Americans units. 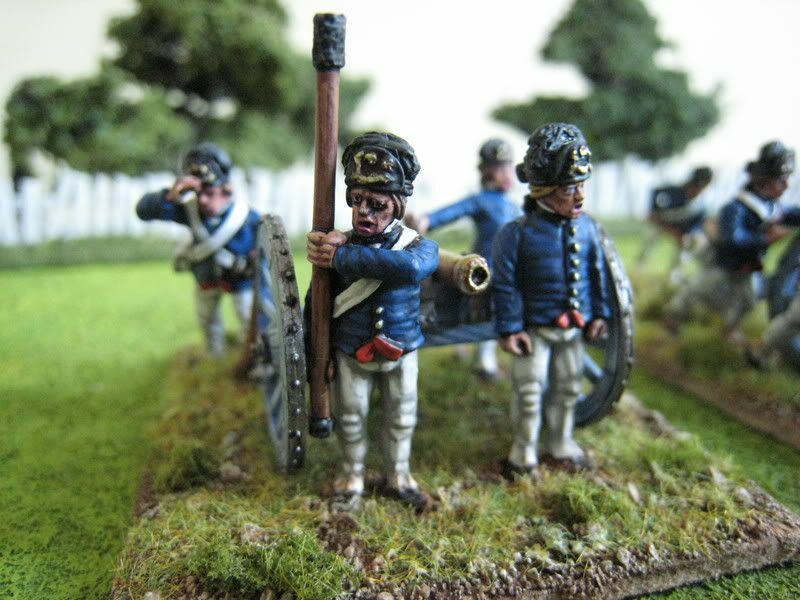 This regiment is largely a mix of Foundry and Eureka figures, with a couple of Perries thrown in. Over the years I have revisited all my "small" battalions and bulked them up to larger units. 18 figures. Painted August 2003 and December 2005. Flag by GMB. The 10th Foot was raised in 1685 as the Earl of Bath's Regiment and became the 10th in 1751. The regiment was present at Marlborough's great victories at Blenheim, Ramillies, Oudenarde and Malplaquet. It took no part in the Seven Years War, being posted instead to Gibraltar and Ireland. The regiment arrived in America in 1767 for garrison duty on the Great Lakes. It then moved to Boston in 1774 and elements of the regiment were engaged at Lexington and Concord the following year. The regiment went on to fight at Bunker Hill (the 10th's flank companies), New York, Brandywine and Monmouth. In 1782 the regiment took the county name of "North Lincolnshire". 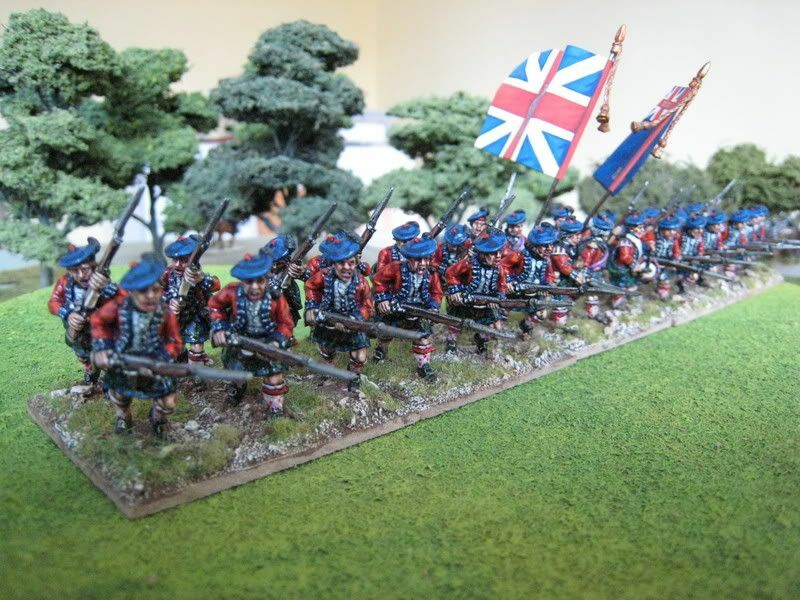 This regiment was the second British unit I painted, after the Black Watch. I originally decided to use the Brandywine order of battle as a focus and started by building up James Grant's brigade from Knyphausen's division. For that campaign, the regiment was brigaded together with the 5th, 40th and 27th Regiments of Foot (some sources also include the 55th Foot). 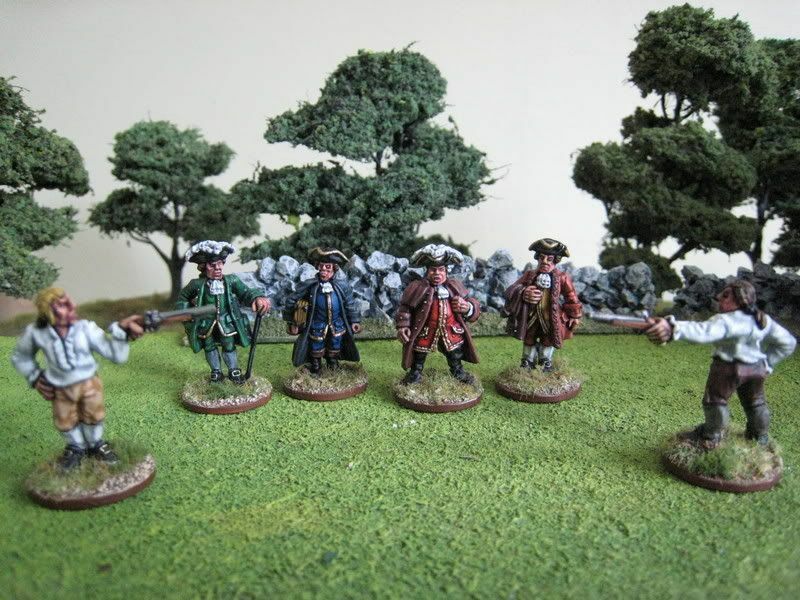 Given that Brandywine was fought in September 1777, I decided to use the Perry "campaign dress" figures of slouch hats and cut-down coats. All the regiments in the brigade are clothed this way other than the 40th Foot which I put in roundabouts, following the della Gatta paintings showing this regiment at Germantown. There is a recreated 10th Foot and I have added their informative website to the links section. The yellow facings here were painted with the Foundry "Ochre" palette, which I find gives a better effect that the more "lemony" yellows over a black undercoat. 16 figures. Painted August 2004. Flags by GMB. 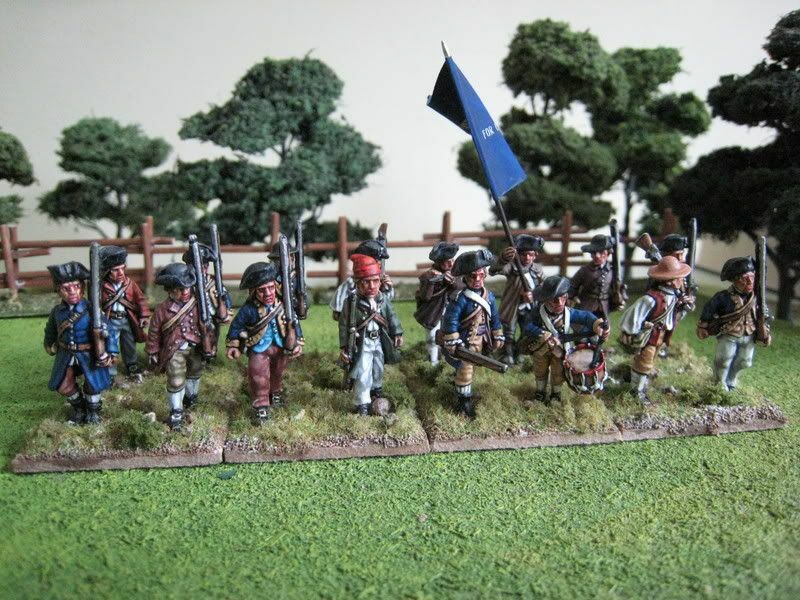 Although there are plenty of "minutemen" figures available in 25mm, one way of modelling a militia battalion is to throw in a few figures in the same uniform. This then creates a unit that can double-up as a ragged or newly-raised Continental regiment. 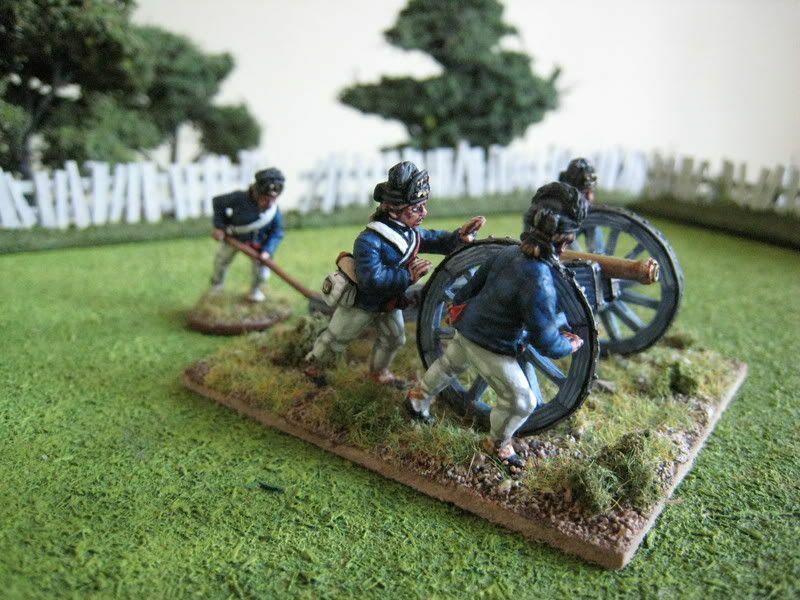 I have a couple of units that can "swing both ways", as either militia or a state regiment. Foundry make "uniformed militia" packs that are perfect for such use, not least because they don't have bayonets, and these figures are largely a mix of the "uniformed militia marching" and "marching minutemen" packs. 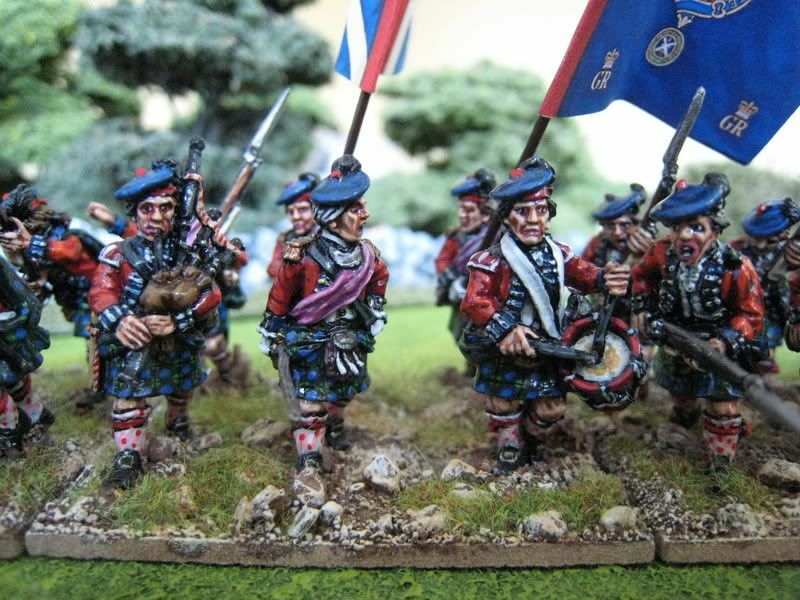 The officer, fifer and standard bearer are Perry figures. 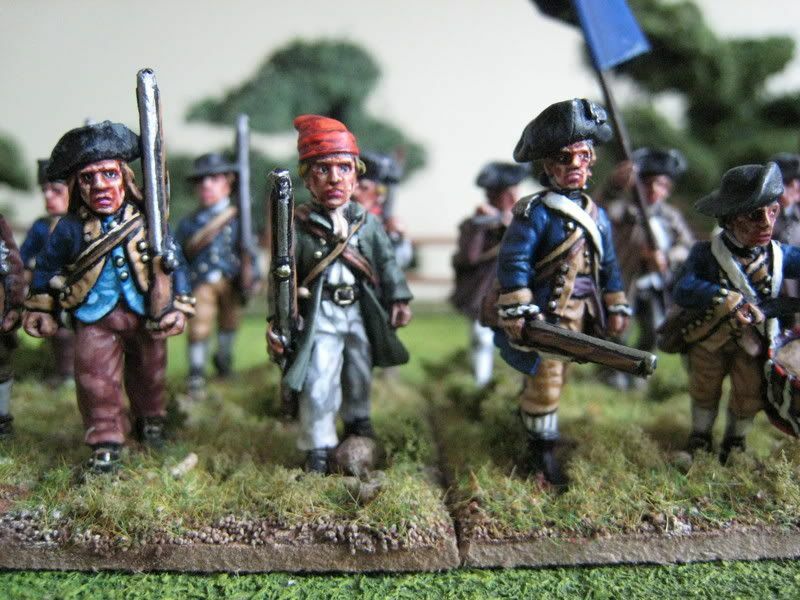 When painting the faces of these figures I tried to make them look more than a little apprehensive at the thought of marching into battle with seasoned redcoats. The flag marks the men out as a Virginia regiment (the legend says "Virginia for constitutional liberty"). I used blue faced buff for the uniform coats as that scheme is pretty generic and seems to have been fairly common. 16 figures. Painted March 2006. Flag by GMB. 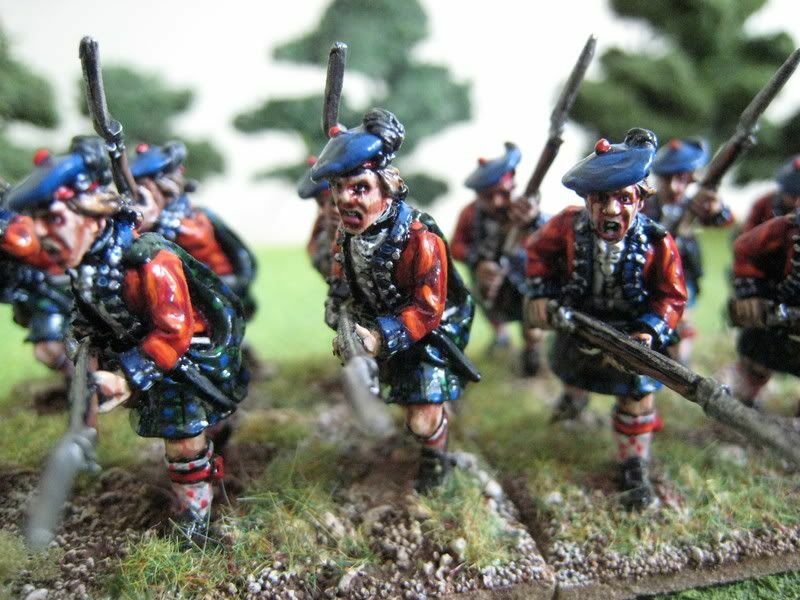 The Black Watch was one of the most famous regiments in the British Army (since 2006 it has been a battalion within the new Scottish Regiment). It was originally raised in the late 1720s to police the highlands and stop livestock rustling and general inter-clan feuding. In 1739 the various companies that existed were turned into a formal army regiment. 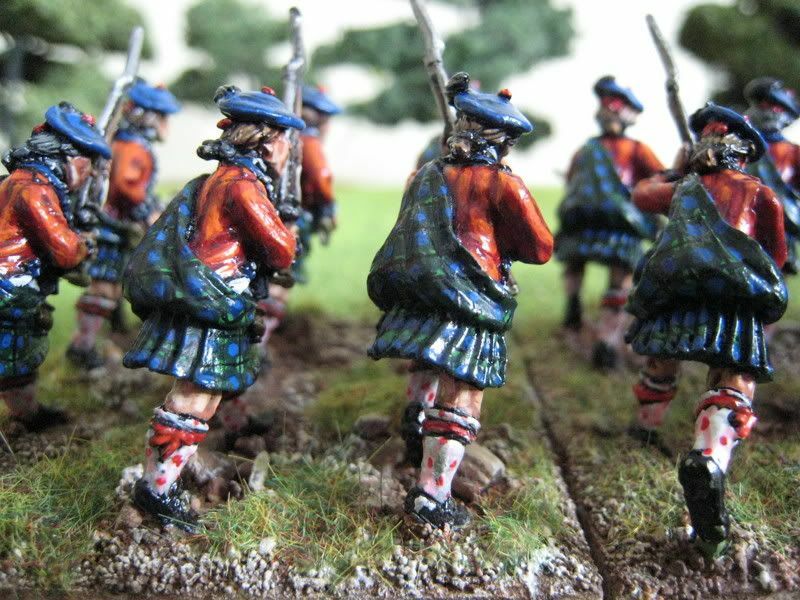 The origin of the regiment's nickname seems to be the very dark colour of its tartan and the fact that it existed to "watch" other highlanders, although I have also read that the "black" might refer to the element of spying and night-time police work that the regiment engaged in. The regiment saw action at Fontenoy and the French & Indian War. It was after the Battle of Ticonderoga in the latter (1758) that the regiment was awarded "royal" status. The regiment arrived in America in July 1776 and participate in the battles of Brooklyn, Brandywine, Germantown and Monmouth before heading down to Charleston in 1780. After a another spell in New York the regiment was posted to Canada. Along with the Queen's Rangers, this was the first AWI unit I painted. 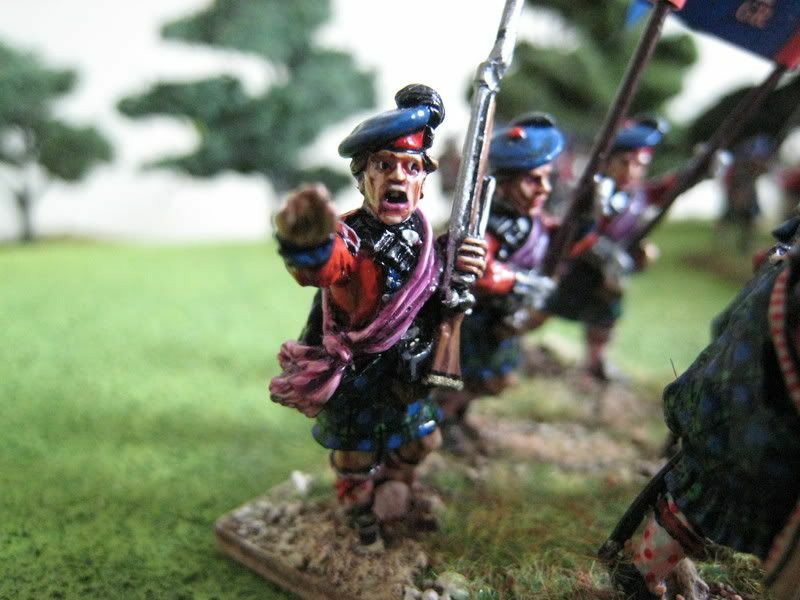 In fact, these charging highlander figures were largely responsible for tweaking my interest in the period; they just seem to sum up everything that makes the horse & musket era so dramatic. 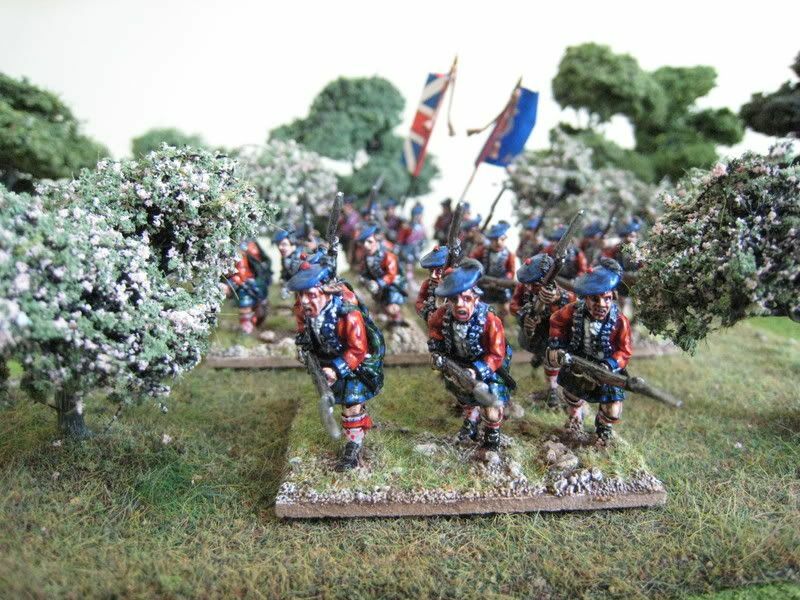 The battalion was built up over a fairly long period of time, with a final base of 6 figures added for the NAM Monmouth refight in November 2005, as the "British Grenadier" scenario requires 32 figures for this regiment. The photos show 4 stands of centre companies and the light company. If necessary, I can add another stand of 6 grenadiers to bring the unit up to 36 figures. 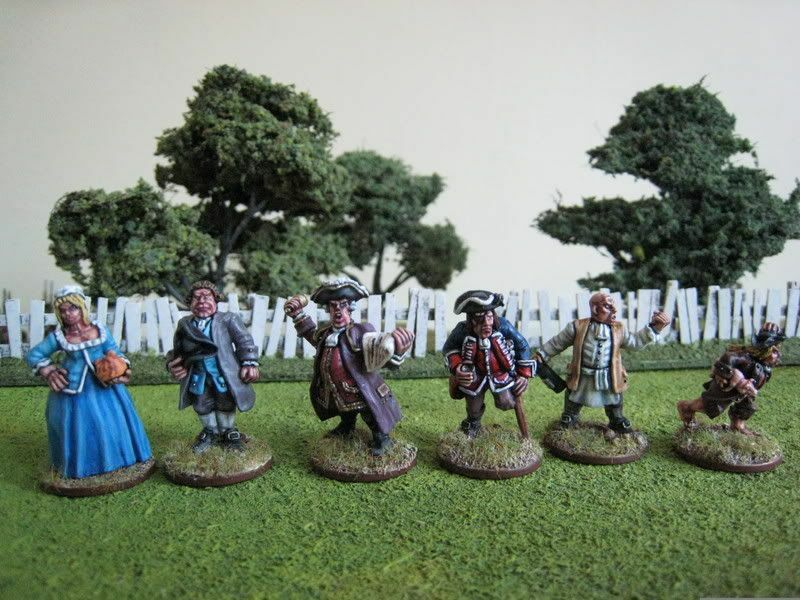 The Brandywine scenario requires 24 figures, so just leave off the light company. 32 figures. Painted at various times in 2004-2005. Flags from GMB. Whilst I finish off the next pack of newish Foundry civilians, I thought it might be instructive to compare the Duellists below with some of the older Foundry Seven Years War figures, one of which I only finished off painting last month. 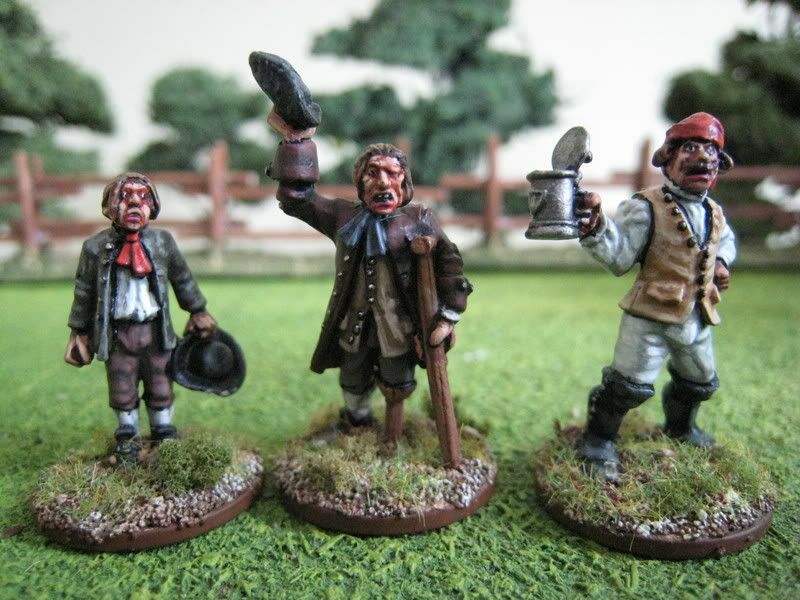 These 5 sculpts are by Mark Copplestone and are from the Prussian part of the SYW range. They (or at least some of them) were originally released some 10 years ago as part of the original Guernsey Foundry SYW range. In those days the figures were sold separately, which is how I acquired the preacher. Now these figures can be found in two packs. 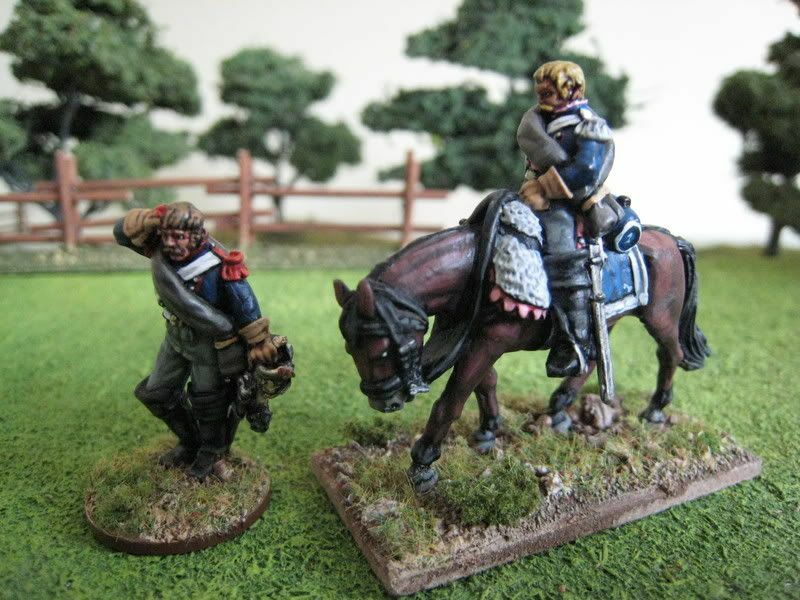 All save the preacher come from the "Prussian Vignette" pack (which includes two Prussian officers which feature on my Hessian generals stands). The preacher can be found in the "Camp Followers" pack (which includes 3 cantinieres, an army policeman and a femme fatale). Compared to the new Rob Baker sculpts, these figures are far better proportioned and more "25mm", although the hands are still on the large side (just look at the size of that raised fore-finger!). 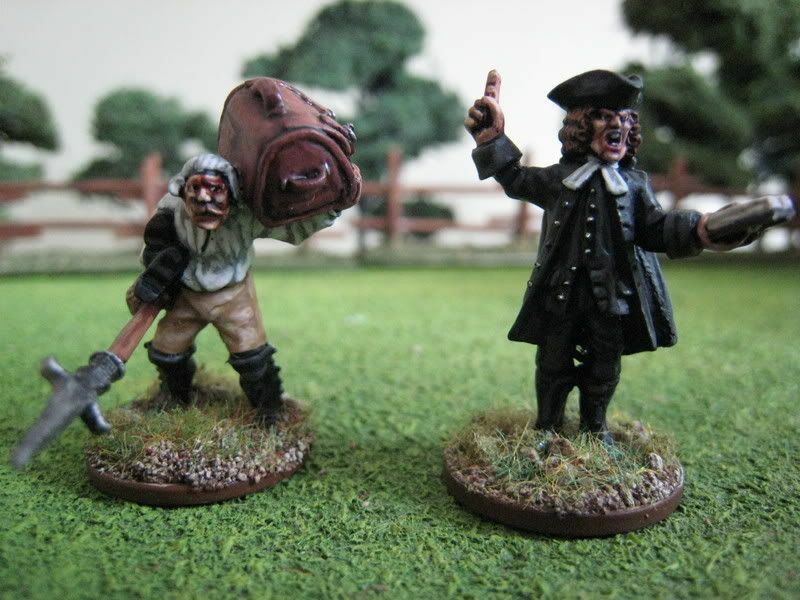 But I like these sculpts a lot, particularly the preacher and the oppressed Hessian servant. Incidentally, I see that these close-up shots show the danger of not giving a finished figure a final check to ensure any excessive black-lining is corrected. The Hessian servant in particular has suffered from over-zealous black-lining and as soon as I saw this picture on my screen I went and tidied him up! Painted April 2007 (the preacher) and August 2005 (all the others). 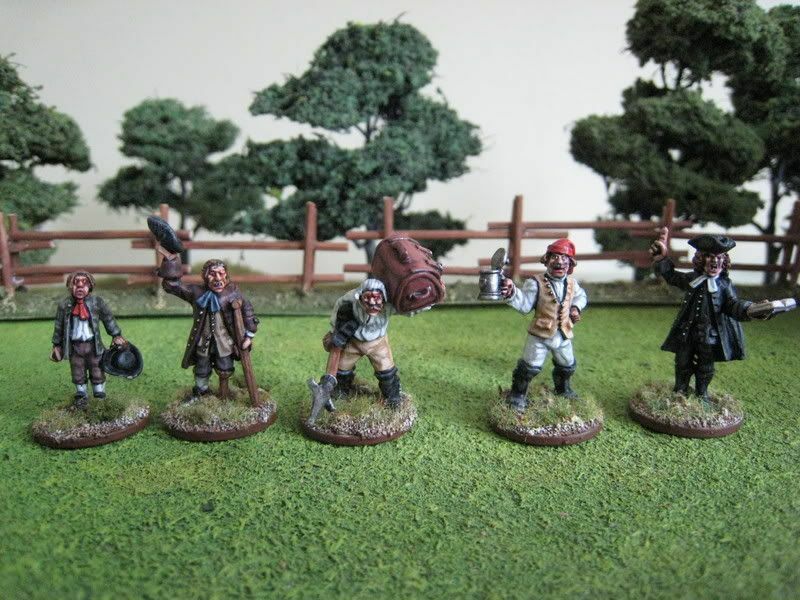 This is the duellists pack from Foundry's civilian range. The civilian packs seem to be part of a proper range, as this pack was labelled "CIV 4" as opposed to a random add-on to the SYW range. This pack and others in the range have not been officially released yet, although you may be able to buy it by phoning Foundry and asking (but watch out for the £7 postage if you don't spend another £50!). I bought this pack at Salute and I think it is rather fun. The sculpts are by Rob Baker and are quite different to the Perry figures I am used to painting. The proportions are, to be polite, a bit odd. The hands are huge in comparision to the rest of the bodies, as are the leg calves and backsides. The square-jawed faces required a rather different painting technique. All that said, I found these figures enjoyable to paint and I think they've turned out ok. I originally intended to base all the figures on one stand, but I couldn't find one big enough to provide a decent space between the two duellists. Basing them singly provides more flexibility of use in any event. Inspiration for 18th century fashions was provided by an exhibition catalogue of paintings by George Romney (1734-1802), lesser-known contemporary of Gainsborough and Reynolds. Flicking through this book it became clear that fashionable young men in the 1760s and 1770s often wore brightly coloured 3-piece suits, and all the figures here save for the duellists themselves are taken from Romney's portraits. So, for example, the bright green suit of one of the seconds is taken from a portrait of a chap called James Hazard. Not much is known about him other than that he died in Brussels on 3 August 1787 "in the service of his country", as Colonel-General of the Patriotic Cavalry. Apparently Brussels was in a state of armed unrest during thew period from 1787 to 1792, due to a revolt against reforms proposed by the Austrian Emperor Joseph II that the insurgents claimed violated medieval charters and local privilges and liberties. I had not heard of the "Brabant Revolt" before; an interesting piece of 18th century trivia. 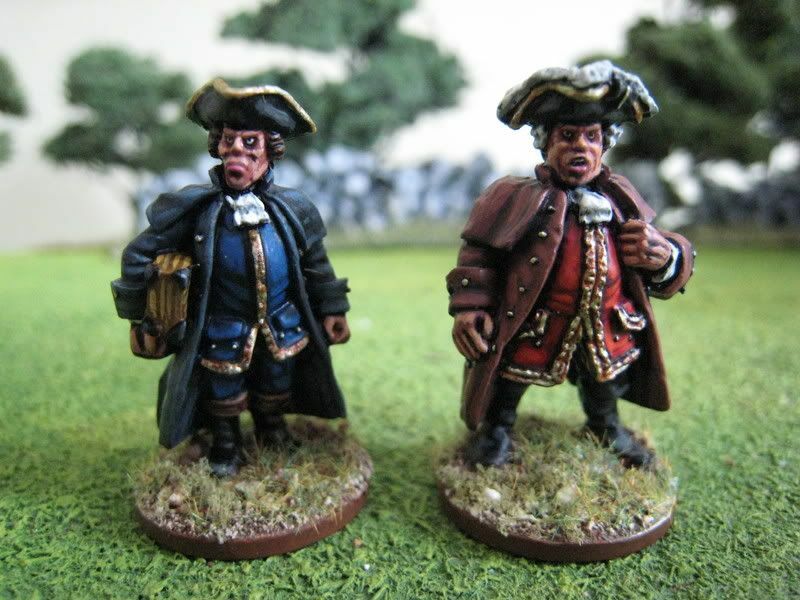 The other second is modelled on a portrait of Richard Cumberland, a playwright and part-time diplomat; I painted his fur-trimmed coat and breeches with the Foundry "terracotta" palette. 6 figures. Painted April 2007.
at least for now. There are a few packs I bought for Salute which I didn't manage to finish which I want to complete at some stage this year, but I have now returned to the AWI where I intend to remain for the forseeable future. 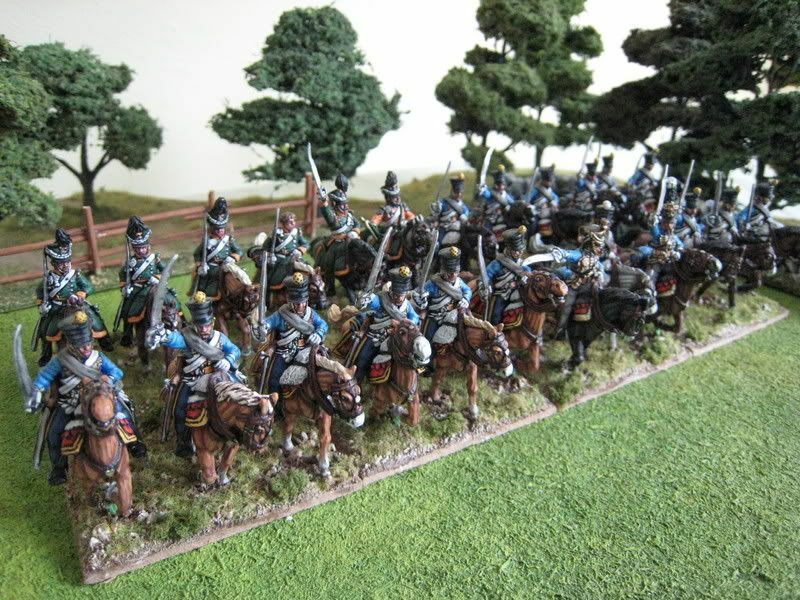 I thought I'd put up a couple of photos of bits and bobs that I brought along to the Waterloo game. 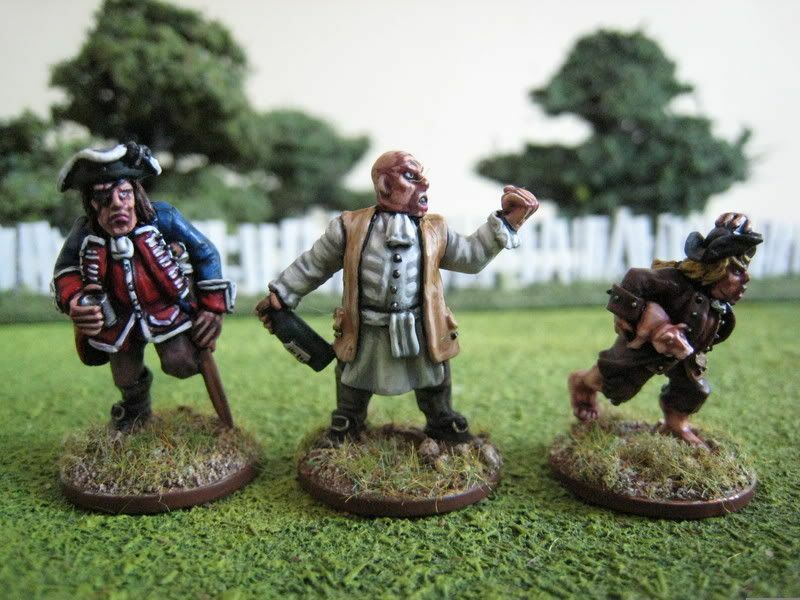 Above are figures from the "Cavalry casualties" pack from the Perry Dutch-Belgian range. Below are photos of one of the Imperial Orderlies from the 1815 French range. There are two other Imperial Orderlies in the set which I will add to some corps or divisional command stands at some stage. I noticed that this chap seemed to move about the game - I'm not sure whether he had any specific gaming function, but I suppose you could use a figure like this when rolling to see whether changes of orders are successfully relayed. The rider and horse are one casting and I noticed that the horse is a fair bit bigger than other horses in the 1815 ranges (it makes Napoleon's horse look quite small, for example). 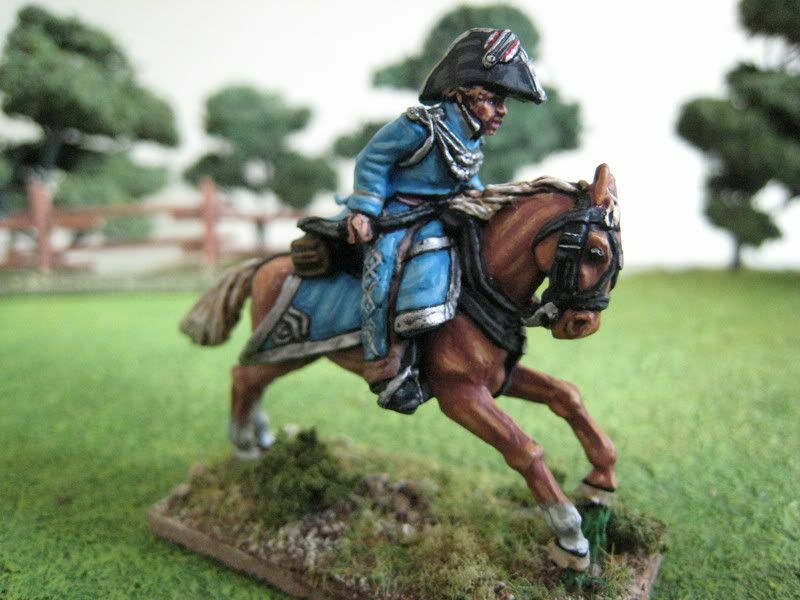 Incidentally, this is the only cavalry figure I have ever painted (I think) with black reins and harness; for some reason I just prefer dark brown. These figures were all painted in March and April 2007. 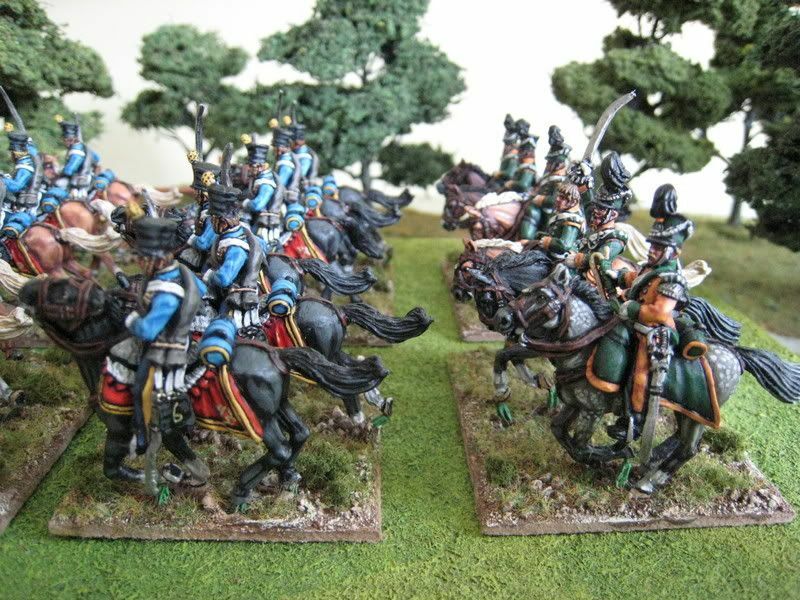 This is the second regiment of Dutch-Belgian cavalry I painted for the Salute game. 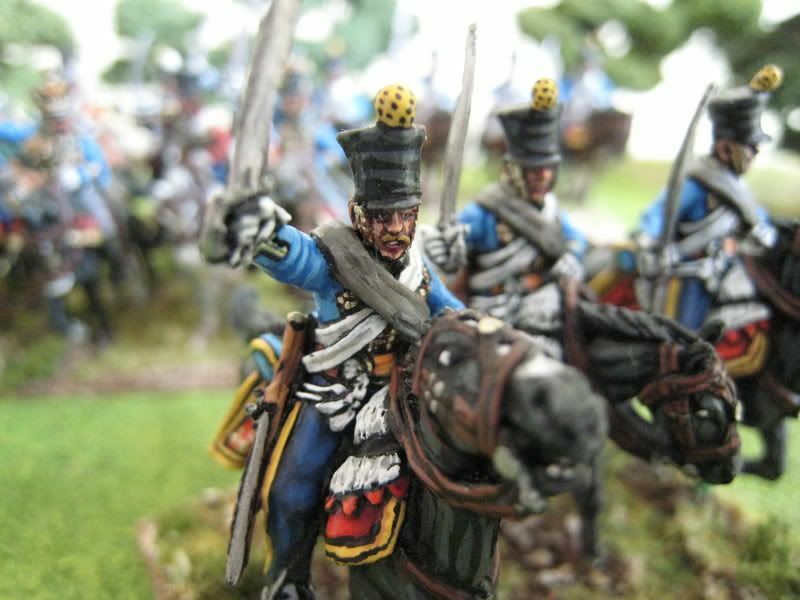 It incorporates 6 figures representing the Volunteer Light Dragoons (in the second rank wearing green and orange uniforms), men who were attached to Dutch cavalry regiments in small numbers. These troops, and their trumpeter on his grey horse, can be seen in the picture above right. 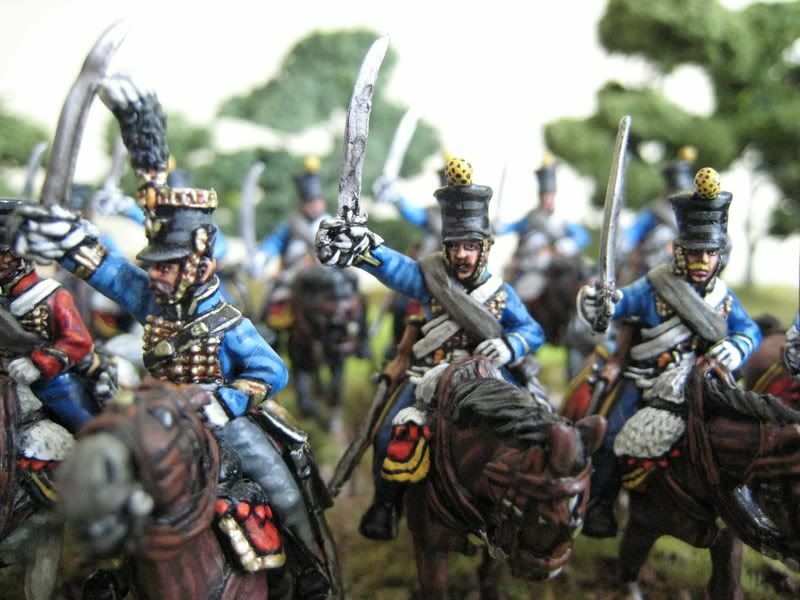 Unlike the Belgian 5th Dragoons, I gave each squadron of the hussars a separate horse colour - chestnuts, bays and blacks. 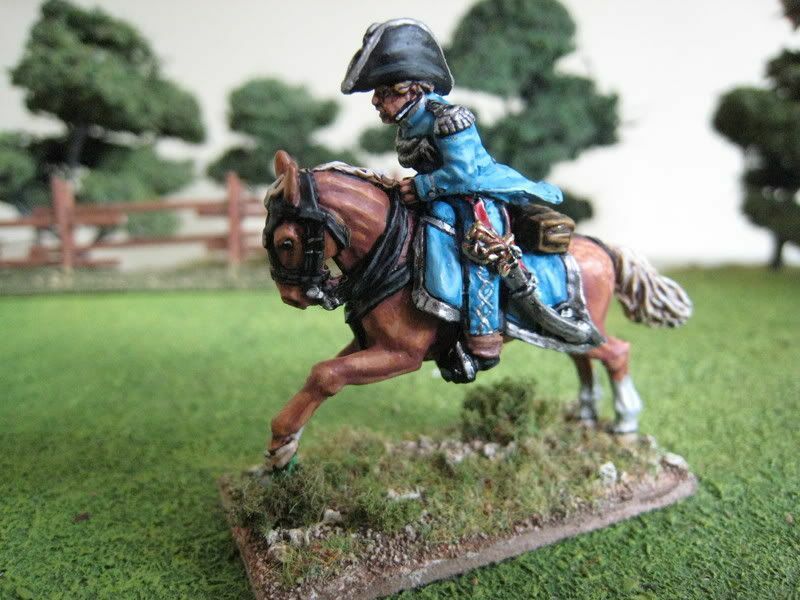 The light dragoons, being self-equipped volunteers, have their own horses. In the Waterloo game at Salute this unit waited patiently until the very last turn of the game, when it engaged and defeated an elite regiment of French Carabiniers due to a very lucky dice roll! 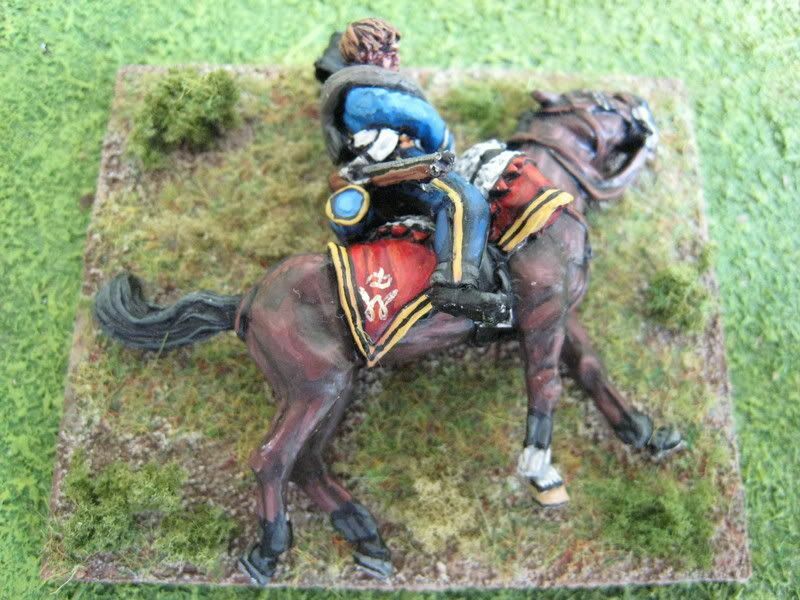 These were quite fiddly figures to paint, particularly the horse furniture with the royal "W" cyphers. 24 figures. Painted January and April 2007.